Mall Road is located in the central area of the city a level below The Ridge which is also an important road in Shimla. Shimla is a city built in the mountains so the city roads also showcase the hilly aspect of the city. Shimla was built in the colonial rule in India and was known as the summer capital of India as many officers escaped to Shimla to beat the heat in the summers. Mall Road was an area built that has the cultural and governmental city center of Shimla. Today there are many government offices like the municipal corporation, the fire service, and the police headquarters is also located here. The Town Hall Municipal Corporation building which was renovated recently is also located at Mall Road. The local theatre called Gaiety Theatre is also located here and most popular plays and stage performances are held at this theatre. Mall Road in Shimla is located in the city center and there are tourist offices on this street. Most tourists visiting Shimla visit Mall Road as this is the cultural hub in the city. Shops, showrooms, departmental stores, and specialty stores are all located here and it is a great place to shop for the tourists. Tourists can also buy handicraft items and local items like woolen clothes, pottery, clothes and jewelry, and other such shopping items. There are great cafes and restaurants at Mall Road and the tourists can also visit the local bars and clubs in this area to enjoy their vacation in Shimla. Connecting Mall Road with The Ridge is the famous Scandal Point. Many tourists visit this area as there is a scandalous history to this featuring a love affair and elopement between a Maharaja and a Viceroy’s Daughter in the 19th century. The Ridge is another popular tourist destination near Mall Road. The nearby Kali Bari temple is an ancient local temple in the area often visited by tourists. Shimla is a top tourist destination in India and easily accessible by road and air and there are lots of places to see in Shimla. Many highways and routes lead to Shimla by road and the Shimla Airport is just 14 kilometers from the city center. There are daily flights to Shimla from many major Indian cities and Shimla is accessible to tourists by rail also. The famous Kalka Shimla railway line is well known for its scenic route. 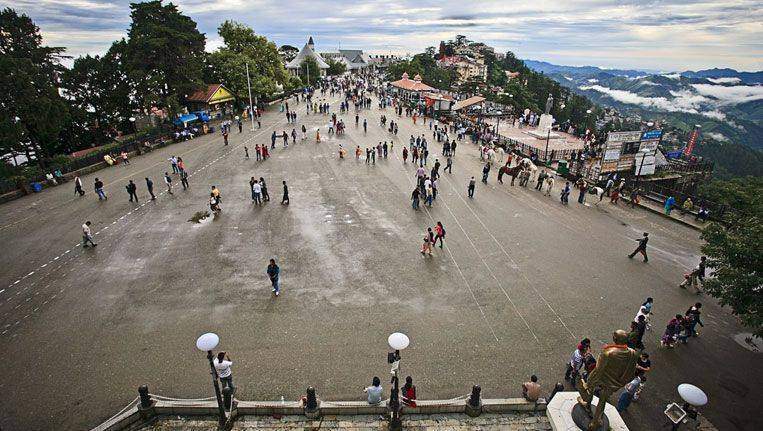 Entry of vehicles is prohibited on Mall Road as the governments want to keep some areas of Shimla vehicle free for pedestrians. Reaching in a nearby area by private vehicles or buses and then walking to Mall Road is a good idea. Mall Road is considered the main street in Shimla and it is a must-visit tourist destination for people visiting Shimla and looking forward to exploring this beautiful city.